Ring-tailed lemur (Lemur catta) playing with a football at the Isle of Wight Zoo. Banded Demoiselle, Calopteryx splendens (Harris, 1782), is a well know and familiar damselfly. This adult male was found resting on grass along the banks of the River Thames at Windsor. Useful things to note are the metallc blue wing veins and the coloured band on the wings, although this is variable. Females are metallic green, with metallic green wing veins and no banding on the wings, although again these may vary! Mallard ducks, Anas platyrhynchos, sitting on some steps to the River Thames in Windsor town centre. 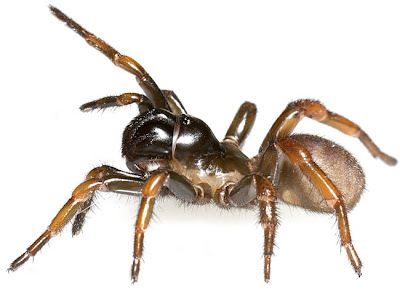 This recently discovered trapdoor spider, Myrmekiaphila neilyoungi, has recently been named in honour of the muscian Neil Young by scientists at the American Museum of Natural History, New York. This was sent to my phone by a friend last night, with a request for identification. It's a cockchafer (Melolontha melolontha), quite well known for being attracted to lighted windows. I know they're not invertebrates, but I thought you might like to see. These were all on the Long Water, Hyde Park towards the end of March this year. This mould appeared over the weekend. The eggs of phasmids are pretty tough, and generally survive attacks by mould. In this case the mould is removed by gently rubbing the eggs. Mould can also be controlled by allowing the eggs to dry out for a short period fairly regularly. It is possible to sterilise the surface of various butterfly eggs using dilute sterilisiation solutions, so I may give it a try as a mini-experiment. These photographs are of L1 nymphs just hatched from eggs given to me by Allan Harman late last year. I have previously kept Lamponius guerini (Saussure, 1868) (I guess many phasmid-philes have), so am interested to see if there are any interesting differences. The April 2008 BCG meeting was an outstanding success, with over 20 members attending, many for the first time. The meeting opened with an informal gathering, with members discussing all manner of topics amongst themselves. Wandering around I overheard various snippets regarding collecting trips, the sharing of rearing advice for tricky species, and who has what species in culture, amongst many others. Introductions aside the meeting began in earnest with George's talk on his collecting trips to Madagascar. This was full of new and interesting observations, including the habitat and distribution of various species of Hissing Cockroach. George mentioned that these inhabit the dry forest areas, and are not found in the rainforest on the Eastern side of the island. The highlight of the last trip was the discovery of a new genus of Hissing Cockroach, a particularly strong and feisty species. George had bought along a live specimen of this species that actively defended itself while Ingo was trying to photograph it, causing him to bleed. The second presentation was a video clip of Adrian's recent TV appear on the BBC. Adrian visits a pest control convention every year and tries to convince the attendees that cockroaches are more interesting than they thought. I gave a presentation on the new BCG website, showing what content was online already. There were a number of suggestions from the members present that will hopefully be making their début on the site soon (so keep checking back). The final talk was by Phil Bragg who gave an illustrated account of cockroaches that he has seen whilst collecting stick insects in Borneo. Many of Phil's photographs are already available in the Image Gallery on the website, and he has promised more will be available soon! Lunch gave everybody the chance to talk about what they had seen, and browse the various specimens on display. George had prepared a drawer of specimens from the museum collection, and showed people the new genus of cockroach he had found in Madagascar. Several members hadinteresting species to show. The livestock exchange saw a brisk trade of insects, with a number of species changing hands. I for one came home with rather more species (and individuals) than I had planned! Many thanks to George, Adrian and Phil for putting together their talks/presentations, to George and Judith for organising the meeting, to Allan Harman for carrying the Madagascar map board from the Entomology Department and back, and to everybody who came for making the meeting such a success.